Ruth Kannenberg, age 82, went to the Lord on 4-17-18. She is preceded by her parents Otto and Rose Kannenberg, her brother and sister-in-law Conrad and June Kannenberg and nephew Bruce Kannenberg. She is survived by her nephew Bruce's wife, Janice, aunt of Brian (Teresa) Kannenberg, Dale (Becky) Kannenberg, Carla (Dan Carter) Kannenberg and Mitchell Kannenberg-Carter. She is also survived by many great nieces and great nephews. 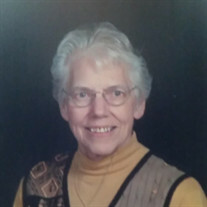 She was a proud member of the Lutheran Woman's Missionary League, a proud member of the UC Alumni and a volunteer member at Grace Lutheran Church. She was an active bowler and loved working at JoAnn Fabric's. Visitation will be Monday, April 23rd at the Vitt, Stermer and Anderson Funeral Home 4619 Delhi Rd. from 10AM until time of service 12 Noon. In lieu of flowers, memorials may be made to the Grace Lutheran Church, 3628 Boudinot Ave, Cincinnati, OH 45211.